Written by: Jessica Greenlee on October 22, 2013. Sorrow’s Knot is a powerful book, one I do not hesitate to recommend to lovers of story, particularly lovers of fantasy. Otter, Cricket, and Kestrel live among the free women of Westmost at the edge of the world, as far west as it is safe to live, protected by their binder, Willow. She keeps the dead out of the settlement with her knots and her power. The dead come in many forms: the little dead, shadows that can kill and the White Hands, the dead whose touch transforms the living into White Hands. Still, life is good in Westmost, and the trio are happy there: Cricket is training to be a storyteller and Kestrel to be a ranger, one of the few who travel past the edges of the settlement for needed goods. Otter plans to follow her mother as a binder. Then they find that Willow’s power is going wrong, turning backward, and she seems to be going insane. Otter herself begins to find that the knots are stranger than she thought, and the power she wields is stranger and more dangerous than she had thought. Bow excels at the local, the small community that intersects with the larger world. Otter and her friends may, eventually, affect the world past their settlement, but their actions and their choices are all bounded by and grounded in their community, their family, and the world within a few days’ walking distance. The memories held in story may go back some generations, but they are still smaller-scale stories, the tale of Mad Spider which forms the backbone of Sorrow’s Knot is the tale of one woman and her people, not an epic of Homeric proportions. This makes them stronger, in their way: They are not the stories of far off heroes, but stories of home, local guides that the free women turn to for guidance. They cannot follow blindly, however, and much of what the novel follows an attempt to tease out the threads of story, to find out what matters, why, and how–and to learn what is not always told. There is a high price for false interpretations, both personal and communal. I praised Plain Kate when I reviewed it, and it is a good book; I’m counting on it standing up to any number of rereadings. I have to say, though, that Sorrow’s Knot is better, deeper and stronger and wilder, a book I could not read in one sitting because I had to stop to catch my breath, and one I did not really put down when I was through because I kept mulling it over afterward. 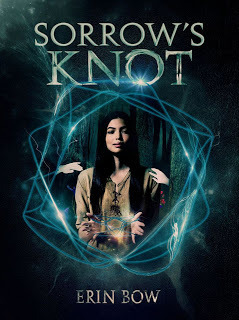 I want to read Sorrow’s Knot again, and I want to read Erin Bow’s next book, and the one after that. I may run out of ways to commend her, though, if she keeps on improving. Side note: I happen to be in the middle of a Robin McKinley rereading at the moment, and it struck me, as I listened to Beauty , that the two authors have a kinship. Don’t expect an identical experience: Erin Bow’s books take place in a harsher world than any of McKinley’s (except possibly Sunshine ), but it seems to me that someone who likes McKinley, and/or someone who likes Diana Wynne Jones, might also like Erin Bow. Curious? Read a description and find an excerpt here, on Erin Bow’s Blog. Disclaimer: Review copy provided by the publisher. A positive review was not specified, and all views expressed are my own.